Convert MP4 to AIFF, M4A, FLAC, WAV, WMA easily and other 150+ video & audio formats. AIFF stands for Audio Interchange File Format, and was developed by Apple computers for the use of audio on Mac computers. AIFF is also said to have a higher quality when compared to lossy audio formats such as MP3. When you want to store music from a music video in Mp4 format, it would be best to convert it to AIFF and not MP3. This way you will have better sound quality and a lot more. You can create accurate lops for use on sampling hardware and other musical productions. 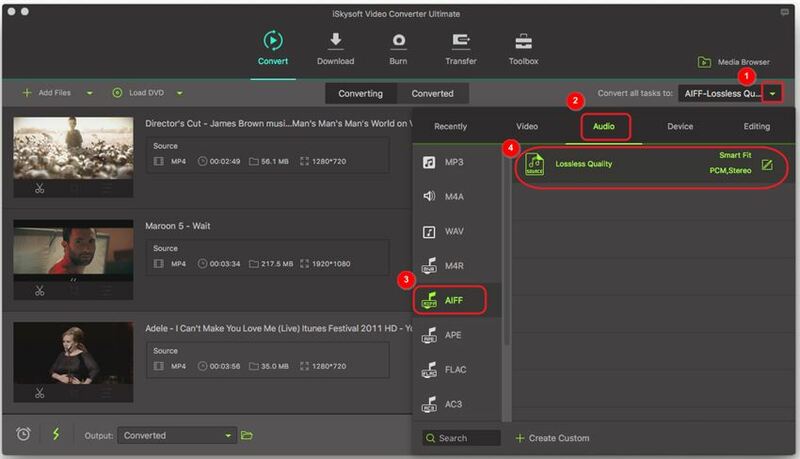 This is the reason why you should use iSkysoft Video Converter Ultimate to convert MP4 to AIFF every time you need to extract sound from a video. It is not a coincidence that most of the video editors today use iSkysoft Video Converter Ultimate for converting their MP4 files to AIFF. It is all because of the goodies it has on offer and which you should capitalize on to the maximum. Generally, it is a 2-in-1 program that will allow you to download and then edit online videos with ease. If you want the videos to have a personal appeal, you can customize by cropping, trimming and adding subtitles before they are converted. That is the main advantage of having a program like iSkysoft Video Converter on your side. Convert MP4 to AIFF, M4A, MP3, AAC, FLV, AVI and other 150+ video/audio formats. The following are the detailed intructions on how to extract AIFF from MP4 with iSkysoft MP4 to AIFF converter, and note that the Windows version functions almost the same. Before getting started, you can take a look at the video tutorial to get a rough idea on how it works. It might appear simple but never treat importation of MP4 files to your program any lightly. The straightforward option of dragging and dropping has been proven to be the best but adding files through the menu bar is equally viable. You will be required to go to the main menu and then choose the "Add Files" option from the dropdown menu. You will be free to add one file at a go or many at the same time. Expand the output format tray by click besides Convert all tasks to:, then go to Auido > AIFF and specify Lossless Quality in the right, this will ensure you to extract .aiff audio file in original quality. Now click Convert or Convert All to activate MP4 to AIFF conversion on your Mac immediately. Then just leave the rest to the great MP4 to AIFF converter tool. In a while, you'll get the Success sign which means the MP4 to AIFF conversion completes. Now switch to the Converted tab to fetch the extracted .aiff audio files.